The first book of Day by Day Armageddon took us deep into the mind of a military officer and survivor as he made a New Year's resolution to start keeping a journal. The man kept his resolution and brought to us the fall of humanity, day by day. We see the man transition from the life that you and I live to the prospect of fighting for his very survival against the overwhelming hordes of the dead. We see him bleed, we see him make mistakes, we witness him evolve. The highly anticipated sequel to the best-selling underground cult classic, Day by Day Armageddon, begins where the first novel left off. Armies of undead have risen up across the U.S. and around the globe; there is no safe haven from the diseased corpses hungering for human flesh. But in the heat of a Texas wasteland, a small band of survivors attempt to counter the millions closing in around them. Day by day, the handwritten journal entries of one man caught in a worldwide cataclysm capture the desperation--and the will to survive--as he joins forces with a handful of refugees to battle soulless enemies both human and inhuman from inside an abandoned strategic missile facility. But in the world of the undead, is mere survival enough? ©2010 J.L. 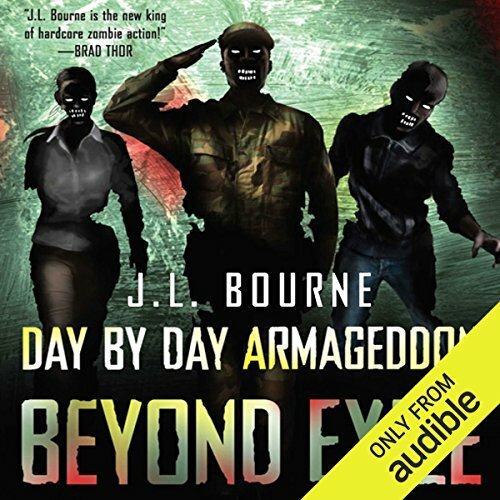 Bourne (P)2010 Audible, Inc.
Make sure you start with Book 1 "Day by Day Armagedon" then sit back and enjoy Beyond Exile. I love J.L. Bourne's writing style and the Narrator Jay Snyder, has the perfect voice for this part. I enjoy a good Zombie story and or movie, some more then others, and this is rated right up there with my #1 picks. Please keep the stories coming Mr. Bourne !! This book is very well written, he draws you into the story very well. I had my reservation but not any more. I have listened to both books and enjoyed them very much. The first book well like everyone says ends very abruptly , but the second pick's up right where one left off. This is a must read/listen for anyone interested in the zombie genre. I would highly recommend this to anyone and I truly can't wait until the 3rd one come out. Another excellent installment in the ongoing Zombie Armageddon. Often times the sequel to any book (or movie) isn't able to hold up to the expectations of the original. Beyond Exile is certainly one of the few exceptions, with J.L. taking us on a new and equally intense journey. If you are into the Zombie/Post Apocalyptic experience and/or you enjoyed Day by Day Armageddon, Beyond Exile is a must read. So this book is the sequel to "Day by Day Armageddon". The story explained in the format of the main character reading back his diary. The book picks up the day after the events at the end of the previous book. The book takes quit a few twist and turns, introduces new friends, new groups with unknown allegiances, and deeper explanation of what is going on with the undead. Although for every question that this book answered, it brought up two more. The one thing this book has that I thought was missing from the story is a "long trek to safety while scanvanging for items'. This is also the first time that our protagonist is actually all alone for a time. That one section was truly masterful. I generally enjoy these books for fun, and that one section is the only place that actually gave me a chill. If you like book one, there is no reason I can think of that you wouldn't like book 2. Jay Snyder is a great reader. He does the voices with ease, even when he has to use a accent. I think zombies + great story + great reader = a good time. I hope book 3 will be written and released on audible soon. Hope you enjoy it as much as I did. The story is as good or maybe better than the previous book. There is never a dull moment in this new macabre world of the undead. It also leaves the possibility for a third book. I can't wait. The narrator was also very good. If you liked the first book even a little, then this is a worthwhile listen. If you liked the first book Day by Day Armageddon you will like this one. it isn't exactly more of the same but it is almost as good. Occasionally a bit clumsy as the author tries to crowbar the 'story told through diary entries' mechanic into some fairly unlikely places, the story takes a bit of time to find it's feet and get going but when it does it's a solid and entertaining read. But it's definitely worth a read because book 2 is very, very good indeed. I listened to this book five years ago and I'm still impressed, the attention to detail, the plot, the intense. This is a book to revisit every few years or so. Let's face it: too much zombie fiction is pure dreck. Throw together a good dollop of gore, a virus, some medical mumbo jumbo (patient zero, mutation, strain, CDC, USAMRIID, replication, incubation period), and a hero who saw it all coming but nobody listened. Add plenty of lurching, twitching, and moaning corpses. Garnish with a love interest, and maybe a sprinkle of political pontification. And there you are. This book isn't like that. It has characters who act like people might actually act. It has a believable hero. It has women characters who aren't just paper dolly cut outs. It doesn't try to explain what's happening with pseudo-scientific claptrap. It just tells its story. Well-narrated too--dry, raspy, and effective. It ain't art. But it's a great listen, and at the top of its undead class. Nach dem Ende des ersten Teils konnte ich es kaum erwarten, weiterzuhören. Selbstverständlich sollte man bei einer "Zombie-Geschichte" keinen allzu großen Anspruch erwarten, dennoch geben die Selbstreflexionen und Betrachtungen des namenlosen Helden dem Buch eine gewisse Tiefe. J. L. Bourne gelingt mit diesem Buch vor allem eines: Man wird mitgerissen in eine apokalypische Welt voller Abgründe und einigen wenigen Inseln des Friedens. Spannend von der ersten bis zur letzten Minute.